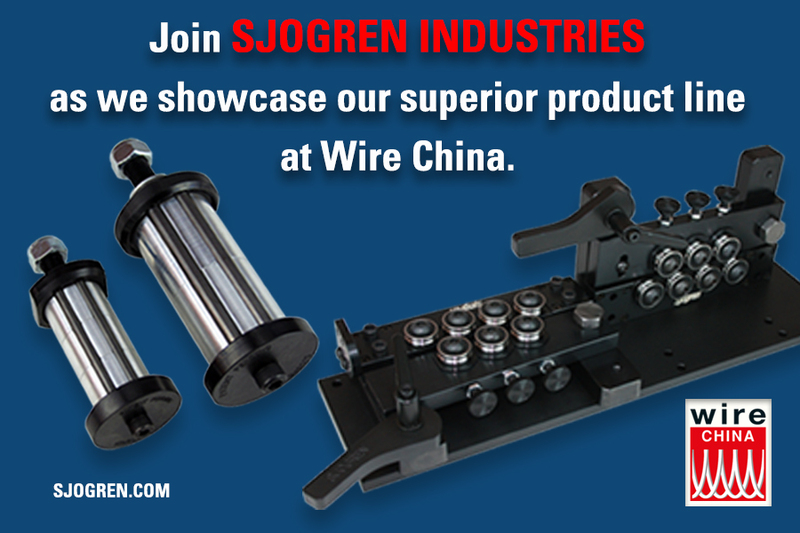 Join Sjogren Industries as we showcase our superior product line at Wire China. Visit Sjogren Industries at Booth W1A42 and learn first-hand about our growing legacy as a wire and cable industry innovator. Wire China gives Sjogren another opportunity to display its innovative product line. The Static Dancer Roll (patent pending) replaces the conventional dancer roll or tuner roll on a wire drawing machine. With the conventional roller, the combination of high heat, draw lube contamination, and general wear causes wire surface scratching, ball bearing seizure, and constant maintenance. The Pivot Bar (PB) Series maximizes efficiency with a design that minimizes space and set up time while eliminating the need for complicated and costly base plates for mounting. The PB Series comes with grooved rolls and precision ball bearings and available digital readout adjustment capability. S&H-TR Thumb Release Wedge Grip and the Vaughn Thumb Release Wedge Grip are designed by and only available from Sjogren. The grips are fully compatible with Sleeper-Hartley style puller assemblies and Vaughn style puller assemblies which are common across the industry. Also, Sjogren’s one-of-a-kind Preventative Maintenance program for straighteners and groove rolls is designed to keep your lines running and minimize downtime, all the while increasing productivity and profits. Sjogren has put together a recommended maintenance schedule based on the type, material, and usage of your particular rolls. If you have not registered for the Wire China show, visit wirechina.net. For more information on Sjogren Industries, visit Sjogren.com.